After many years of being operated as a mental health service by Framework Services, Kelmarna is embarking on a new journey. 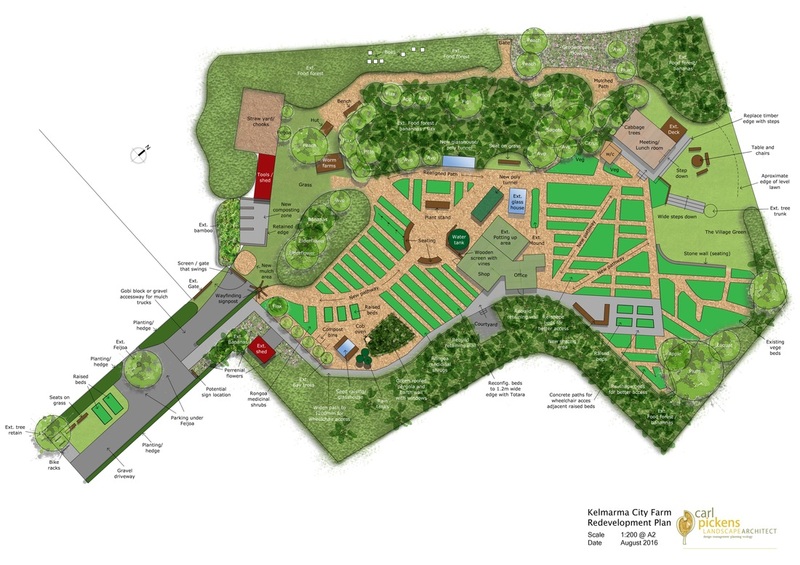 We are seeking to build on its founding principles as an organic demonstration garden, a therapeutic garden, and resource for sustainable education for our community. It is an exciting time to revitalise our garden and volunteer community, and to invite our neighbours, local community and partners to help create a model for sustainable living in Auckland. To achieve our vision, we are embarking on a major project to re-develop the garden itself, including improving the garden layout and upgrading the facilities. Landscape Architect Carl Pickens was engaged to work with the garden community to create a new design, and help oversee the implementation in coming years. Carl has a wealth of experience in garden design and planning, with specialisations in sustainability, organics, and permaculture. You can read more about Carl on his website here - http://carlpickens.co.nz/. Earlier work in progress/draft concepts below.